Because of their beauty and the fact that they "look weird," many people with saltwater aquariums want to put a starfish into their tank. The starfishes don't move fast, and they look harmless, so why not? Right? Maybe not. Cute as they are, they can destroy a lot in a tank in a relatively short time. Some starfish, such as the Sand Sifting Sea Star (Astropecten polycanthus) are specifically chosen for their ability to stir up the sand in DSB's (Deep Sand Bed) in reef tanks. They do keep the sand stirred up, but they also consume everything in "Live Sand" except the resident bacteria. It is a trade-off that many reefers are willing to make, thinking that they can always replenish whatever the starfish eats. 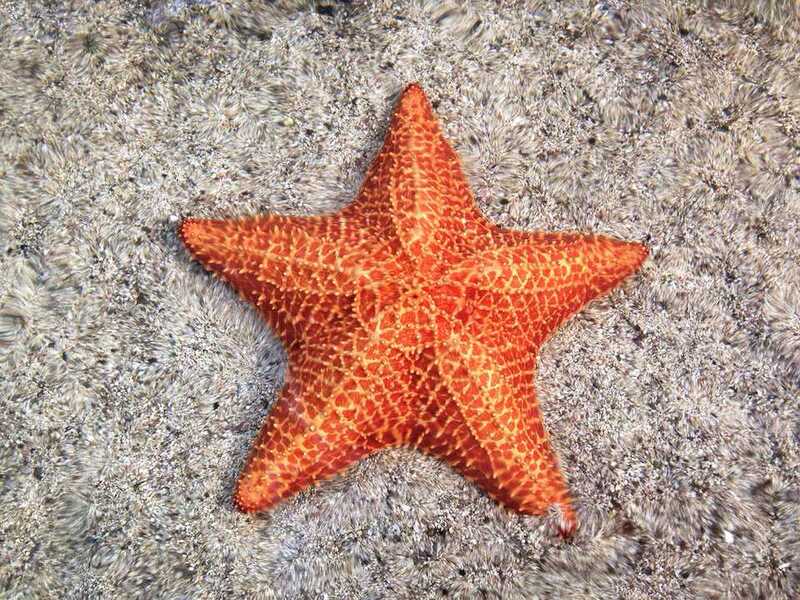 Some starfish, such as the Chocolate Chip Starfish will consume almost any type of coral they come across. Starfish are divided into three classes; Asteroidea that contains Sea & Cushion Stars, Ophiuroidea that contains Brittle, Serpent & Basket Stars, and Crinoidea that contains Feather Stars & Sea Lilies in the Subclass Articulata. Even though some starfish species do eat algae and most are scavengers that come out at night to feed on detritus and debris, here are some other important things about them that need to be considered before buying one. Depending on the species, many are predatory animals that will often attack and eat a wide range of invertebrates such as other starfishes, urchins, sponges, anemones, soft and stony corals of all types, coralline algae, clams and other mollusks, crustaceans, and sometimes even unwary or sleeping fish. Some starfish will survive in an aquarium if fed bits of clam, shrimp or other meaty fares, even though this might not be their natural diet. Many species can grow to quite a large size, which can cause a problem with them disrupting other tank life as well as possibly toppling or rearranging live rocks and corals. Starfish inhabit many oceans from warm tropical to cooler water regions around the world, so make sure the type you are getting is suitable for the tank temperature you have. Inspect any starfish before buying it to make sure it is healthy. A limp or weak specimen is a poor choice, and even though some may recover over time, most do not. Prospects should be active, moving and full-bodied, and with sea star species the tube feet should be visible. A good test is to turn the starfish over on its back and see if it rights itself. Also be wary of wounds that appear to be fresh where arms are missing, as these are potential sights for infection or disease. For more details about what to look for when buying starfish, we suggest reading the "Selection" section of Robert Fenner's "Sea Stars, Class Asteroidea" article. To keep starfish in top condition in an aquarium, water quality should be excellent and nitrate levels very low, preferably unmeasurable. When it comes to buying a starfish, or any livestock for that matter, it is important to research any particular species thoroughly, before you buy it, so remember to look up any information you can find first.